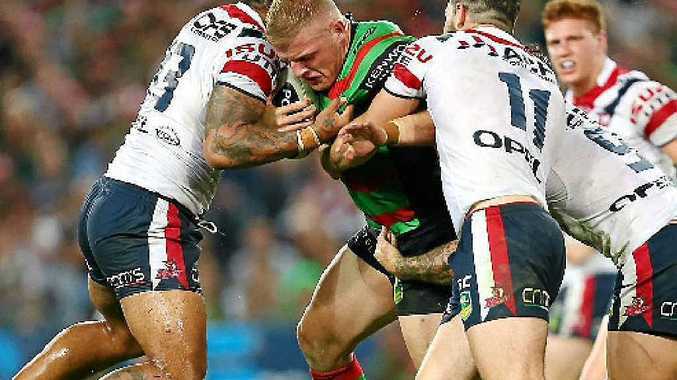 FORMER South Sydney front-rower Scott Geddes has been blown away with the form of Rabbitohs prop George Burgess this season. And the Maroubra-based personal trainer believes Burgess will once again stand up to a formidable Manly pack in the first preliminary final at ANZ Stadium tomorrow night. Burgess was almost unstoppable last time the two clubs met, churning out 153m in South Sydney's 22-10 win in round 23. "George gives you that buzz every time he touches the ball," said Geddes, who started with Souths when they were readmitted to the NRL in 2002. "Guys like myself and Luke Stuart were just hard toilers, but blokes like George, his brother Sam and even Roy Asotasi are devastating when they run the ball. "I was speaking to Sam in the pre-season and he said 'George is ready to make it his year'. "He's done that - he's really come a long way since last season." Despite the Rabbitohs winning both head-to-head clashes this season - and the Redfern club having the benefit of a week's rest - Geddes said that would count for little in the grand final qualifier. "Last time we played them, they came out and whacked us early," he said. "Having the week off will give us an advantage, but Manly will be up to the pace of the game because of the two close finals games they've played." Geddes, who retired at the end of last year, is tipping his former teammates to be tested until the dying stages of this game. "It will definitely be close, like all the finals games have been so far this season," he said. "We've done well against Manly in recent years and everyone on the street wants to come up and talk to me about this game. "I'm really excited about it, especially when you remember Sam Burgess charging into the Manly forwards all night earlier in the year (when Souths won 20-12 in round seven at Brookvale Oval)." Meanwhile, Rabbitohs captain Michael Crocker announced his retirement yesterday, effective at the end of this season. The Queenslander made his first-grade debut for the Roosters back in 2001, and has been unable to play this year due to a knee problem. "After undergoing surgery in April my focus has been to get back on the field," he said. "Unfortunately, I have arrived at the point where my knee is unable to meet the demands of professional football." Crocker represented Queensland 13 times, and Australia on six occasions. He played 196 NRL games and was part of the Roosters 2002 premiership side and the Storm grand final wining team in 2007.